Chile has just contracted for the cheapest unsubsidized power plant in the world, Bloomberg New Energy Finance (BNEF) reports. In last week’s energy auction, Chile accepted a bid from Spanish developer Solarpack Corp. Tecnologica for 120 megawatts of solar at the stunning price of $29.10 per megawatt-hour (2.91 cents per kilowatt-hour or kwh). This beats the 2.99 cents/kwh bid Dubai received recently for 800 megawatts. For context, the average residential price for electricity in the United States is 12 cents per kilowatt-hour. “Solar power delivers cheapest unsubsidised electricity ever, anywhere, by any technology,” BNEF Chair Michael Liebreich said on Twitter after this contract was announced. Carlos Finat, head of the Chilean Renewable Energies Association (ACERA) told Bloomberg that the auction is “a strong warning sign that the energy business continues on the transition path to renewable power and that companies should adapt quickly to this transition process.” Indeed, in the same auction, the price of coal power was nearly twice as high! 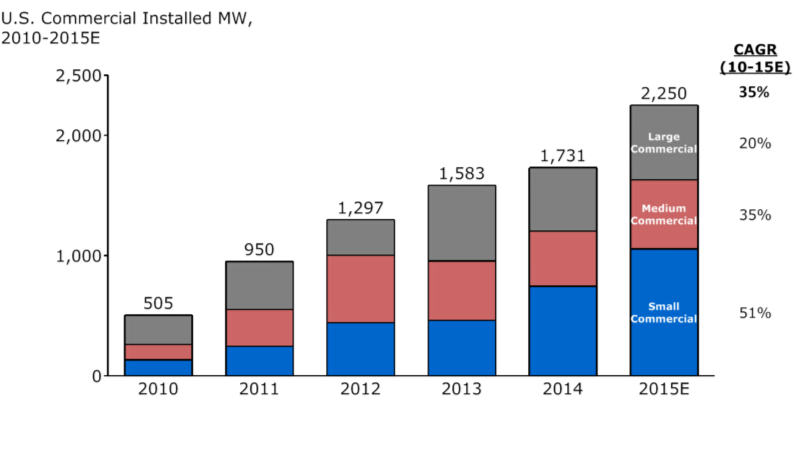 Grid-connected solar power on Chile has quadrupled since 2013. Total installed capacity exceeded 1,000 megawatts this year — the most by far in South America. Another 2,000 megawatts is under construction, and there are over 11,000 megawatts that are “RCA Approved” (i.e. have environmental permits). Chile is aided by the fact that its Atacama desert is “the region with the highest solar radiation on the planet,” according to the Inter-American Development Bank. So much solar is being built in the high-altitude desert that Northern Chile can’t use it all, and the government is rushing to buildnew transmission lines. Chile is part of a global trend where solar energy has doubled seven times since 2000. In the U.S. alone, it has grown 100-fold in the past decade thanks to a sharp drop in prices that has brought the cost of solar (with subsidies) to under four cents a kilowatt hour in many places, as I detailed last month. The future for solar could not be sunnier. California met its goal to produce about half the state’s electricity from renewable sources for three hours on March 11, a new estimate from the U.S. government shows. The U.S. Department of Energy’s statistics division used data from the California Independent System Operator, which manages the electricity grid across 80 percent of California and part of Nevada, The San Francisco Chronicle reported (http://bit.ly/2nAQZST). The record was set when almost 40 percent of the electricity flowing across the grid came from large-scale solar power plants. Factor in electricity produced by area homes and businesses, and solar met about half the overall electricity demand in the middle of the day. Although the surge in renewable power is a key part of California’s fight against climate change, it creates its own set of problems. California produces so much solar power on bright summer days that some is shunted off the grid, in a process known as curtailment. California aims to have 50 percent of all electricity come from renewable sources by 2030. With the Trump administration targeting various government clean energy programs, we can think of no better time to celebrate the U.S. cities with the most installed solar energy. A new report found the country has made some serious solar strides in 2016, particularly in 20 cities across the country. America’s “shining cities” helped the country attain 42,000 megawatts of solar energy capacity by the end of 2016 — enough energy to power 8.3 million average homes and slash annual carbon emissions by 52.3 million metric tons, the Frontier Group and the Environment America Research and Policy Center reported. U.S. Cities by Cumulative Installed Solar PV Capacity, End of 2016. Last year, the 20 top U.S. cities collectively accounted for nearly as much solar power as the entire country had installed at the end of 2010. Solar power is rising across the U.S. and around the world as technology prices and installation costs plummet. In many major economies, solar power (sans subsidies) is starting to outcompete coal and natural gas, and new solar projects are costing less to build than wind farms, Bloomberg New Energy Finance found. Despite the serious increase in solar capacity, the majority of U.S. cities have only just started to tap into their true solar energy potential, the two environmental groups said in their report. Los Angeles, New York City, Chicago, and San Antonio have the technical potential to generate “tens to hundreds of times more solar energy” than they do now, according to the National Renewable Energy Laboratory (NREL)’s rooftop solar analysis for small buildings. The map below depicts each state’s level of solar installation, so you can get a better sense of how beginners in the Midwest compare to “Solar Stars” on the West Coast — though even the top solar cities have room for improvement. With the Trump administration promising to double down on coal-fired power plants and unravel federal policies for clean energy, U.S. cities and states now have an even bigger role to play in tackling climate change. With U.S. commercial electricity prices at their highest point in nearly a decade, many businesses are looking to solar to meaningfully increase their bottom line and drive incremental enterprise value. 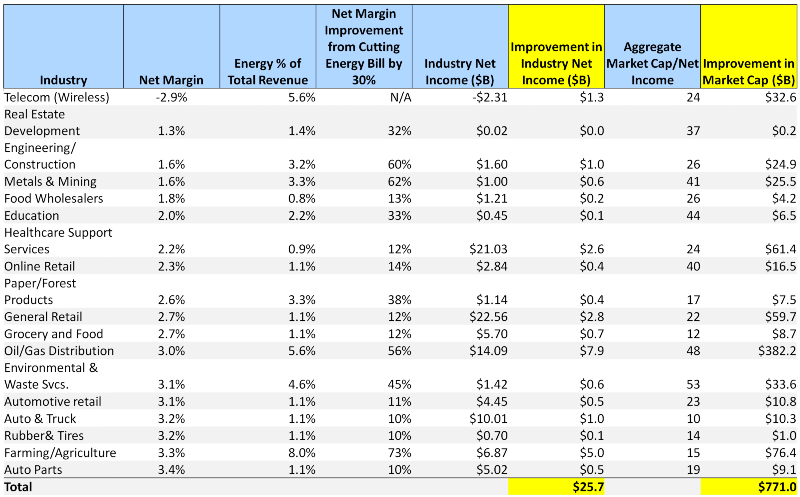 The value that solar can create for businesses becomes especially staggering when you look at how many low-margin industries have energy costs as a meaningful percentage of overall revenue, and therefore how small changes in energy costs can greatly improve company profitability. For sectors from agriculture to mining to waste management, a 30% reduction in overall energy bills can improve net margin — and therefore enterprise value — by over 45%. Even industries with a more modest energy bill, like real estate development, retail, and food and grocery, can still achieve double digit increases in profitability. In the 18 industries below, these savings equate to over $25B in Net Income and $770B in Market Cap. That’s a lot of money to leave on the table. 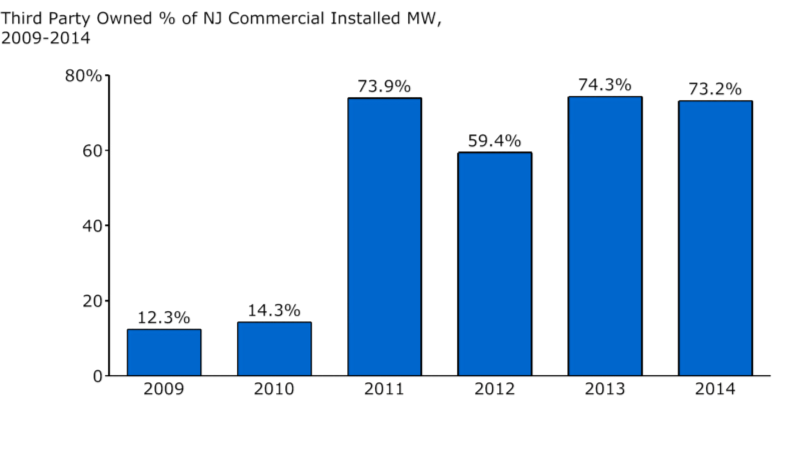 Source: Industry level financial data from Prof. Damodaran at NYU Stern, Energy share of revenue data from the U.S. EIA. Note: Aggregate Market Cap/Net Income ratios were not available for Telecom, Real Estate Development and Education, so Forward P/E ratios were used instead. Power Purchase Agreements (PPAs) have revolutionized solar financing by allowing businesses to lock in (nearly) risk-free savings for $0 down. The concept is simple: a third party pays for the installation of solar on a business’ roof, charges the business nothing up-front, but locks the business into a long-term (usually 20 year) contract to buy the energy produced from the solar installation at a predetermined rate (the PPA rate) with a fixed escalator (usually around 1–2% per year). Since the PPA rate is lower than the retail price of electricity, and the system is owned and maintained by the third party, businesses have limited risk from entering into this type of agreement. In addition to PPAs, there are solar leases, traditional loans, and even Property Assessed Clean Energy (PACE) loans that are repaid through property taxes. The shift towards Third Party Owned (TPO) systems like PPAs, where the business who has solar on their roof does not actually own the system, has been dramatic. This trend is encapsulated well by the New Jersey Clean Energy Program interconnect data, which shows the share of installed solar capacity from TPO systems spike from 12% to 73% in just one year. In any capital investment, having a clearly traceable and highly predictable ROI is critical for financiers (who must backstop the asset) and system owners (who want to ensure that their investment pencils out). Solar energy system output is easily measured with an energy meter, which makes its impact straightforward to quantify. When it comes to prediction, there is a wealth of historical climate data available from organizations like ASHRAE, along with solar energy system design and performance tools like PV Syst, Folsom Labs, and now Google’s Project Sunroof, to provide high accuracy estimates of future energy savings. Solar does not require a behavioral change on the part of employees or customers, or an aesthetic change to the inside of the building, in order to accrue savings. By allowing companies to run their business as usual, they can take advantage of the benefits of solar without bearing the costs of productivity disruptions. While these high-level facts make commercial solar an attractive investment, there are important risks that must be mitigated in order to ensure that commercial solar systems are performing optimally. Lawmakers in California and Massachusetts have recently introduced bills that would require their states to get all of their electricity from renewable energy sources. ECOWATCH — California Senate leader Kevin de León, who introduced Senate Bill 584 last Friday, would require the Golden State to have a carbon-free grid by 2045. It would also accelerate the state’s current goal of hitting 50 percent renewables by 2030 to 2025. Massachusetts legislators have also announced a measure requiring the state to get all of its electricity from renewable sources by 2035. All of its energy needs, including heating and transportation, would have to come from renewable sources by 2050. So far, the only state that has an official 100 percent renewable energy standard is Hawaii. Hawaii’s aggressive clean energy mandate—requiring the state’s electricity to come from renewable sources no later than 2045—was enacted back in 2015. Many renewable-energy loving states—as well as town and city governments—are ramping up their clean energy goals in spite of the federal government’s favoritism of fossil fuels and indifference towards fighting climate change. This month, Nevada assemblyman Chris Brook introduced a bill to ramp up the state’s renewable portfolio standard to 80 percent by 2040. Nevada’s current standard calls for 25 percent by 2025. Dr. Mark Z. Jacobson, a Stanford University professor and cofounder of The Solutions Project, has created a state-by-state roadmap to convert the country to 100 percent renewable energy by 2050. Last year, The Solutions Project team published a study explaining how each state can replace fossil fuels by tapping into renewable resources available in each state such as wind, solar, geothermal, hydroelectric, and even small amounts of tidal and wave power. “It is now established that such a transition is possible state by state and country by country,” Jacobson commented to EcoWatch in December. Also, as USA TODAY pointed out from a University of Texas at Austin study, wind turbines and big solar farms are the cheapest sources of new electricity generation across much of the U.S.
What do you say to the critics who say it is not feasible for California, Massachusetts (or any other state) to get to 100 percent clean energy? Jacobson: They speak without having ever studied the issue or examined the numbers, including the ability to keep the grid stable or the costs of energy. What are some of the specific benefits for California and Massachusetts if they transition to clean energy? Jacobson: Create more net long-term jobs than lost, stabilize energy prices because the fuel costs of wind and solar are zero, reduce the costs of energy since onshore wind and large-scale solar are the least expensive forms of new energy in the U.S. today, eliminate 13,000 air pollution deaths and hundreds of thousands of illnesses in California alone saving 3 percent of the GDP, reduce terrorism and catastrophic risk because of the more distributed nature of the grid and reduce dependence on foreign energy. What are some of the biggest obstacles (i.e. technology, politics, fossil fuel industry) for states to get to 100 percent clean energy? Jacobson: Lack of information and people with a financial interest in the current infrastructure. Once people have full information about the transition and its benefits, most are likely to support the transition. Ninety percent of the blockade to faster progress is due to individuals and companies that have a financial interest in the current infrastructure thus profit over it not happening. Are you working with any of the legislators who have proposed these 100 percent clean energy bills? If so, who? And, what role is The Solutions Project playing in helping states advance renewable energy policies? Jacobson: We provide information to all parties who request it, thus our goal is not partisan. It is purely to help facilitate the healthiest and cleanest future for Americans and the world. The near year is shaping up with plenty of “renewed” interest (in renewables). Here locally, Case Western University is developing a model which will help projecting what the future power grid will look like. The following excerpt is from an article written by Rachel Abbey McCafferty, posted in Crain’s Cleveland Business. Alexis Abramson, director of the Great Lakes Energy Institute at Case Western Reserve University, thinks it’s likely the energy grid of the future will look drastically different from today’s system, upgrading the aging traditional grid and incorporating more renewable energy sources. It’s unclear how all those parts could best work together, but a cohort of Ohio institutions, including Case, aims to find out as part of a new project. The Northern Ohio Building-to-Grid Integration Demonstration is designed to test those new energy scenarios in real-world settings at Case and the University of Toledo, and through simulated tests at NASA Glenn Research Center. The project is funded by the Department of Energy and administered by the Pacific Northwest National Laboratory, a Department of Energy research lab. It has industry buy-in, too. A post on Case’s The Daily website lists the corporate partners as FirstEnergy Corp., Eaton Corp., Siemens Corp. and Johnson Controls International Plc. The project focuses on expanding the laboratory’s research on “transactive control,” the practice of constantly managing energy and building connections to the grid. Together, federal funding and industry investment add up to more than $1 million, according to The Daily post. Abramson, who is one of the faculty members leading the project, wouldn’t get more specific on that point. The funding started on Nov. 1, 2016, and will last for 15 months, Abramson said, but she could see it growing as questions about the grid of the future evolve. For example, instead of just relying on centralized power, a future grid may incorporate solar panels and wind energy, but those sources of energy are only available sometimes. But the grid still needs to be reliable, secure and cost-effective. That kind of complexity “changes the game,” said Abramson, who also is the university’s Milton and Tamar Maltz professor in mechanical and aerospace engineering. The so-called living laboratories — because these buildings will still be in use — in the Northern Ohio Building-to-Grid Integration Demonstration will test out different energy-related scenarios in a variety of types of buildings. Next Post – we will examine in greater detail, that the future of renewables is indeed here in Ohio – Minster, Ohio to be precise. The town recently developed with one of the largest community solar projects, with battery back-up in the world. THE USE OF DISINFECTANTS AT HOME; ARE THEY DANGEROUS TO HEALTH ? As an alternative to welding bigger and bigger “hammers” which is akin to attacking the problem chemically, the sustainable solution is really quite simple, Biology. Enzymes, which are proteins, are grown using yeast and heathy bacteria then harvested. These Enzymes are formulated to break-down specific fats, starches and plant-based residue. When the organic material is dissolved into smaller (non-living) organic compounds, safe hygiene is achieved. When you eliminate the food source of the bacteria, it becomes much easier to achieve a hygienically clean surface. The food sources which the bacteria needed to exist are eliminated and the pre-cleaned water is ready for disposal down the drain. Moreover, sponges stay fresh longer, the drains smell clean and all without the traditional scrubbing and scouring. In the future, we will be focusing on providing specific product info for industrial kitchens, micro-breweries and institutional users. A number of materials used in green roofs are from recycled sources, for example, the membranes and growing mediums, such as crushed porous brick, which is used by some suppliers. In London, uniquely, there has been a move to use recycled secondary aggregate as the growing medium, preferably from the original site.